Bask in the glory of the Tickle Pink Inn high above the world overlooking the amazing Pacific Ocean and the craggy cliffs by calling 831-372-5000 for the perfect room reservation made for you. Pick a room set along the Carmel Highlands craggy shores facing south towards Big Sur and consider a stay in the west facing direct views of the horizon in a fireplace full ocean view room. The room choice is yours. It is wise to now contact free local Carmel Area Reservation Service in order to secure a wonderful reservation at this wildly popular inn where rooms are in great demand! High atop the rugged cliffs overlooking the untamed Pacific and Point Lobos State Preserve this romantic hideaway will enchant you! 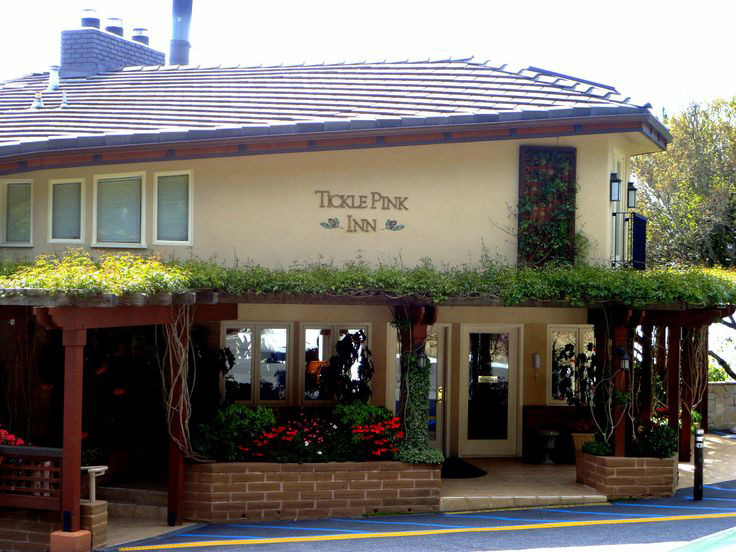 The Tickle Pink Inn located in the Carmel Highlands is a short drive south of Carmel by the Sea along scenic California Highway One. Here you will find complimentary expanded continental breakfast with home baked goodies and an evening wine and cheese reception on the wonderful ocean view deck. There is also an outdoor terrace hot tub for guests to enjoy soaking in under the sky. Each room has king size bed and a view of the Pacific from your own balcony. The Cove View rooms show the rugged coastline rocky shores and waves crashing in. The Ocean View rooms face westward toward the magnificent horizon and sunset high above the bluffs. The Ocean View Suites have fireplaces and jacuzzi bath with a larger space and private deck. All rooms have fresh ground coffee service, lush terrycloth robes and TV. Have even more with a stay in the Senator’s Cottage as you wind along the garden path to find a two bedroom unit with living room and amazing views! There is also an intimate full service meeting facility with essential business equipment for up to ten people for an ocean room board meeting and small private event. Call free local Carmel Area Reservation Service at 831-372-5000 to discuss the possibilities in hosting your next intimate event at Tickle Pink Inn. You will experience free event planning service with personal attention to your ideas for the perfect unique event that will be long remembered by your wonderful guests and attendees!